Every year, as we get closer to the holidays, we hear news reports about people being victims of crime. We are also hearing about possible terror threats. 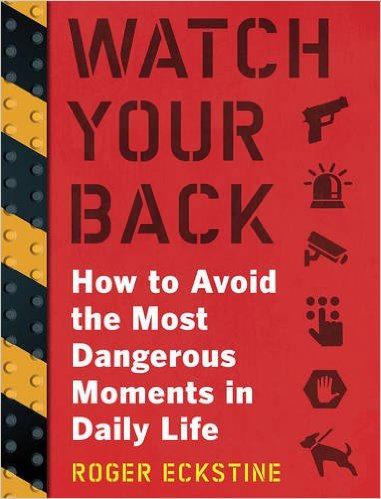 With all these possible hazards, I thought this book is worth a look: Watch Your Back: How to Avoid the Most Dangerous Moments in Daily Life by Roger Eckstine. There are also sections on choice and safe handling of firearms, improving shooting accuracy, hardening a vehicle, etc. Watch Your Back is a very detailed book, giving helpful tips on what to pay attention to and how to handle yourself when you are most vulnerable. Many of the activities described are easy to relate to, while some may not apply to your individual situation. As an example, I felt the section on staying safe when showing real estate property does not apply to me. On the other hand, everyone can relate to using the ATM machine, filling up on gas, and feeling unsafe in certain areas. I like the real life examples given, as well as the pointers on how each situation can escalate and how to avoid trouble. The book is attractive, with full color photos and glossy pages. One lucky winner will be chosen via Rafflecopter to win a copy of Watch Your Back. We’ve made it as easy as possible to enter, with lots of opportunities to win! Disclosure: This is a professional review site that sometimes receives free merchandise from the companies whose products we review and recommend. The opinions expressed here are our own. Apartmentprepper.com is a participant in the Amazon Services LLC Associates Program, an affiliate advertising program designed to provide a means for sites to earn advertising fees by advertising and linking to Amazon.com. I never have my head buried in my phone or have earphones too loud so I can’t hear what’s going on around me. I see both of these too often these days. I live in the second largest city in the U.S. so always have something to defend myself with, at all times–within reach, if not wearing it! One of the things I do is lock my car when I get out to pump gas and stash the keys in a pocket. I make sure car doors are locked before I open the garage door to leave (and close the garage door before turning off the car and unlocking the car doors when I return home). When walking, I keep my head up and pay attention to my surroundings. I only use the ATM and pump gas in the daylight, people are crazy. And I always pay attention to other people, even though I live in a small town. There has been an influx of people here. I try to pay attention to my surroundings and to teach my 21 yr old and 11 yr old girls to pay attention. In the age of social media, it is hard to convince them to put the phones down and look around. I do my best to give examples and we play the what would you do if….. game quite a bit. And with all the unrest over the elections and such, I decided to avoid black Friday shopping. Head on swivel when out and about…..